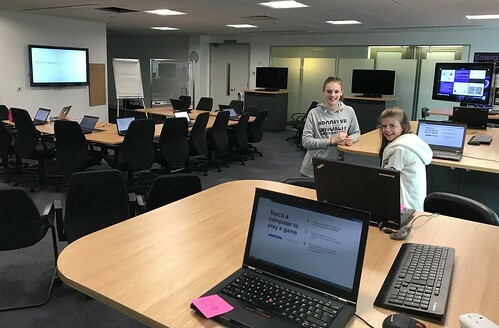 On Tuesday, a couple of dozen children (aged 8-14) spent the afternoon at Hursley so I could give them an intro to machine learning using some of the activities I’ve written for machinelearningforkids.co.uk. I think it went pretty well, so I thought it’d be good to share what we did. This was what the room looked like before the kids arrived… with just my two kids helping me set up. It all got a lot busier after this! The general approach was letting them all work at computers, guided by a worksheet to build something that illustrated an aspect of machine learning. And then following this with a group discussion to draw out what they observed and what it meant. We did this all together for the first couple of activities. Because of the large age range in the group, after this I let them split up and tackle different activities at different speeds, and followed this up by discussing their projects with them in smaller groups.